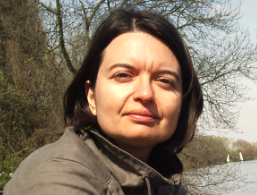 Emanuela Cuomo is an Associate Director in the AZ Discovery Biology department in Cambridge UK. She leads the Cell Biology team and co-leads the Precise genome editing discipline contributing to innovation in the CRISPR field. The Cell biology team generates cell models for target identification and validation for the Oncology disease area, including Immuno Oncology. Emanuela obtained a PhD in biochemistry at the Institute of Cancer Research in London where she characterised a novel viral cyclin/CDK complex, its modulation by CDK inhibitors and its biological function in oncogenesis. Subsequently she joined UCL Cancer Institute in London in the Viral Oncogenesis team as a CR-UK postdoctoral fellow. There, she studied the interplay between the cellular DNA damage response and viral protein kinases. Currently, Emanuela is recognized as an industry leader in the study of cell cyycle signaling in normal and cancer cells. F. O. Rueda, M. Bista, M. D. Newton, A. U. Goeppert, M. E. Cuomo, et. al. "Mapping the sugar dependency for rational generation of a DNA-RNA hybrid-guided Cas9 endonuclease. Nat. Commun., 2017, 8, 1, 1610. M. Maresca, V. Guosheng Lin, N. Guo, Y. Yang, Y. "Obligat Ligation-Gated Recombination (ObLiGaRe): Custom-designed nuclease-mediated targeted integration through nonhomologuos end joining." Genome Res, 2013, 23, 239-246. H. Hofemeister, G. Ciotta, J. Fu, et al. "Recombineering, transfection, Western, IP and ChIP methods for protein tagging via gene targeting or BAC transgenesis." Methods, 2011, 53(4), 437-452. G. Ciotta, H. Hofemeister, M. Maresca, J. Fu, M. Sarov, K. Anastassiadis, A. F. Stewart. "Recombineering BAC transgeneses for protein tagging." Methods, 2011, 53(32), 113-119. This project has received funding from the European Union’s Horizon 2020 Research and Innovation Programme under grant agreement No 765866.